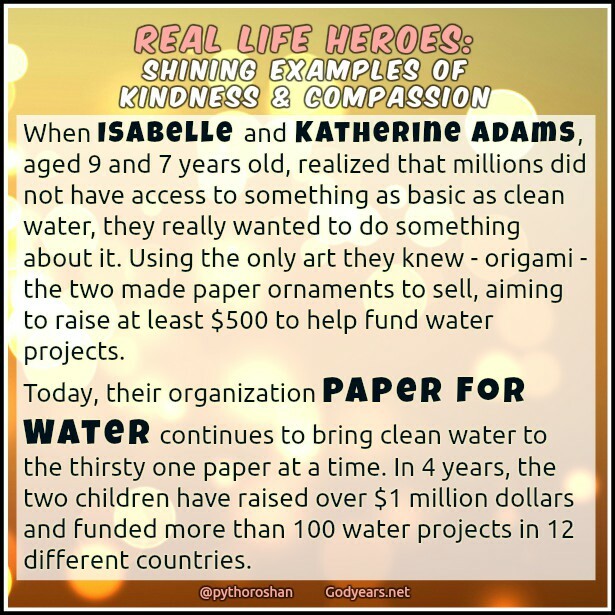 Isabelle and Katherine Adams were 9 and 7 years old when they found out the harsh realities of the world. The sisters were shocked to find out there were so many countries where children, adults and even entire villages did not have access to something as basic as clean water; that a child dies every 20 seconds because of unclean water. They wanted to do something for those less fortunate than themselves. But honestly, what could two children so small do to change the bad bad ways of this world? They finally decided to use the one skill they had learned from the dad - origami, the art of paper folding - to make at least some small difference. The first goal was small, yet significant. They would make paper ornaments for Christmas and sell it at their local Starbucks, aiming to reach their target of $500 (Rs 32,000), hopefully within a month. They reached their target by the end of the first day. By the end of two months, they had raised $10,000 (Rs 6.4 lakhs) - the amount needed to build a well capable of providing water for an entire African village. 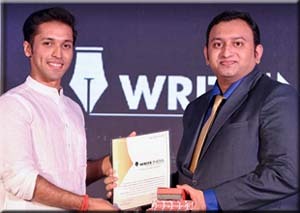 The project evolved into the Paper For Water Foundation whose primary mission even today is to bring water to the Thirsty one piece of paper at a time. By the end of two years, they had raised $122,000 (Rs 78 lakhs) and built wells in India, Ethiopia and many other African nations. 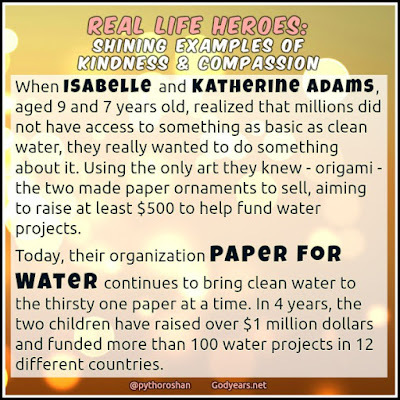 Today, over four years since they sold their first origami, at the age of 13 and 11, Isabelle and Katherine have donated over $1 million (> Rs 6.4 crores) for water projects in Ghana, Liberia, Kenya, Mexico, Ethiopia, Uganda, Peru, Zimbabwe and India. Even In USA, they have funded water systems at the Navajo reservation. 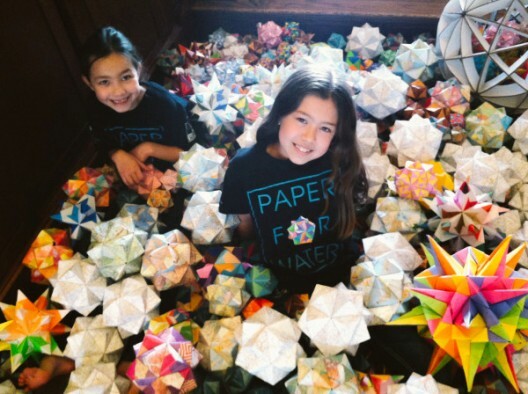 Guided by their parents, Isabelle and Katherine Adams remain co-Presidents of Paper For Water and now have entire teams working to help make origami for their cause. They have funded over a 100 water projects across 12 different countries. 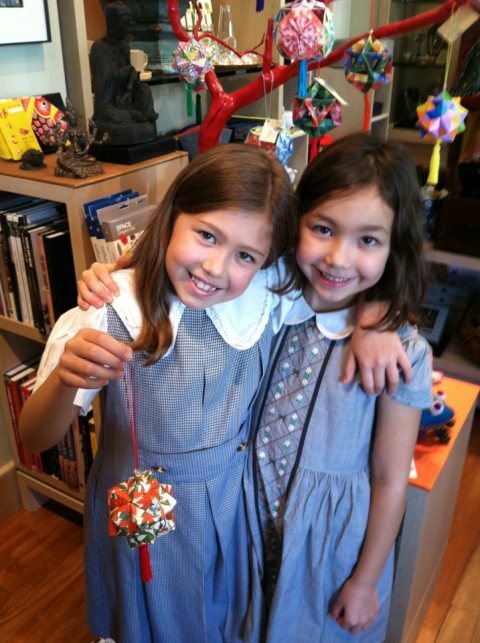 Age definitely is not an issue for these siblings - their younger sister Trinity is 6 years old and the Director of Marketing for Paper For Water, helping the sisters in teaching origami. In 2017, the two begin their World Tour to raise awareness about the need for Clean Water for all and to teach origami so that other kind hearts can help the cause. I asked you in the first paragraph of this article - "What can two children so small do to change the bad bad ways of this world?" I hope you have your answer now. What power there is in an honest intention and dedication to follow it through. Age no bar. I love the idea of service being inculcated as a virtue in kids so young. No better lesson to teach them than this. Very inspiring and thoughtful step ahead. Thank you so much for sharing. Its very true that children can show the way - they don't have doubts and other distractions. Plus adults are delighted to facilitate them. Amazing that these two dreamt so big. Children are amazing, they are the bravest and don't have any prejudice. these two are super. Whoa! These are superbly amazing kids. 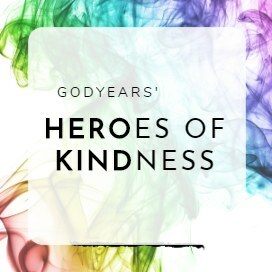 God bless them for their goodness n zeal to do good. How sweet! Imagine how tender their hearts must be to think so empathetically at that age. If we could all instill such values in our children the world would be such a compassionate place. Just goes to show that you don't need to be a certain age or have a certain amount of money to do something for others. just the right intention gets things done sometimes. I am showing it to my daughters right away. 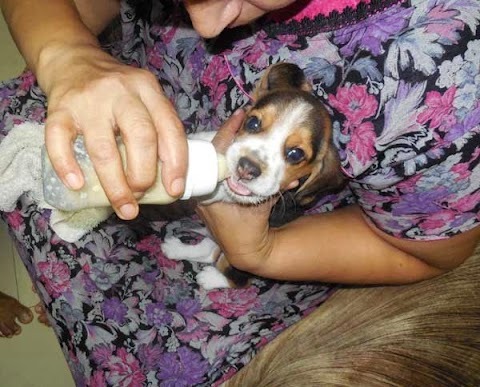 It is such a sweet thing to do and especially when they are both so small. Inspiring. Kudos to parents too. Thank you for bringing such amazing stories of compassion that too by the next gen.
To start with, how talented are these girls! Look at how perfect those origami is. And the thought is so pure. More power to them and their parents for supporting them through it. OMG!! This is a super inspirational story. The 2 young sisters have proved that age does not matter at all. All you need is to have your heart at the right place. Wow! These kids have realized how important it is to help others and so many adults haven't realized the importance yet! Brilliant girls! I really wish to meet them and their parents. Such kindness and compassion. The world is still running because of a few hearts like these. 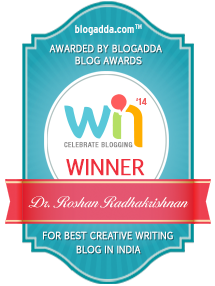 Thank you so much Roshan for sharing this story. Compassion has no age indeed. Sad that some people show no signs even in their adulthood. Whoa! That's brilliant! In such a small age! Well, compassion has no age indeed. What a lovely and inspiring story. Thank you so much for sharing it with us. Gives us a sense of motivation, belief and optimism. Have a look at this Book Review on 2016's bestseller Psycho Thriller. These girls are a great inspiration for kids - and adults! That's absolutely incredible. I often think we could learn quite a bit from children. A thought to remember.What can we do alone? Ecerything if we try.Loved this. Kindness doesn’t have an age bar. I think we lose our sense of compassion while we grow out of our innocence when faced with the realities of the world. Kudos to both the girls!